Now that most of the set-up has been established, writer Zack Kaplan goes to the streets to propel this new series into some exciting albeit familiar territory. Still, with political intrigue and a mysterious alien threat roaming outside of the port area, 'Port of Earth' is finding its legs while being entertaining. Not surprisingly, the deal the U.S. government made with the aliens to allow them to dock on Earth in exchange for new technology, involved the very same corporations that would benefit the most, putting profit over people. This is nothing new in this day and age but this new technology has displaced human workers causing major strife and resentment among American workers. And despite rules in place to keep out alien visitors away from the human population, breaches have caused panic and protest among the citizenry. This brings us to one such case where a rogue alien is on the run suspected of murder and it's up to ESA agents McIntyre and Rice to track it down. The agents are scouring the city looking for this mysterious alien and the trail leads to the sewers. Rice is the level-headed one that goes by the book, encouraging Mac to wait for backup. Mac is gung-ho to find this creature and kill it. He's headstrong and wears his prejudice on his sleeve. It's a familiar trope, good cop-bad cop, and it parallels the attitudes of xenophobic Americans today. It's a metaphor for the anti-immigrant, anti-refugee sentiment that has gained attention now about fearing the "other" among us. The timeliness of this makes 'Port of Earth' compelling but the dynamics of the agents offers little nuance. Nonetheless, the story reads like a political thriller set in a future world before evolving into sci-fi horror. The chase builds up, increasing the tension along the way while the two agents bicker about procedure and justice. Andrea Mutti creates a dingy dark underworld that the agents have to navigate where anything can appear. The alien reveal is pretty shocking and colorist Vladimir Popov makes the most of the limited confines with a sustained murky color palette. 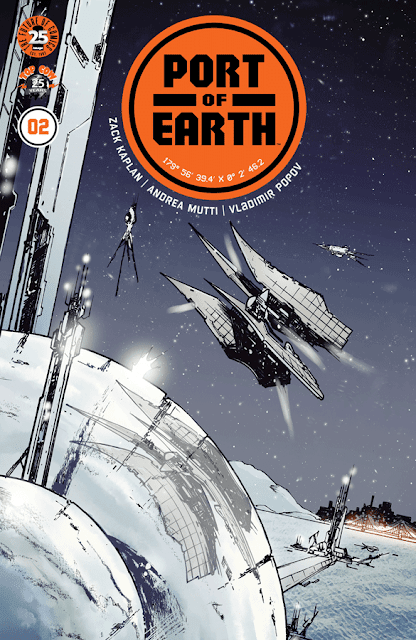 'Port of Earth' is by its very nature is a political story. When aliens make a deal with our government benefitting mostly corporations, the losers in this agreement will almost always be the public. Heap on top of that the sudden influx of space traveling aliens and the potential for conflict and misunderstanding is a virtual guarantee. The story continues to unfold with more explosive revelations sure to come to light. Make sure to get on board now. Overall, I agree with your review. Just read the second issue and have been pretty pleased so far. It certainly is reflecting the politics and issues today. The quick moments where groups like the ACLU are described as unimportant to the process. This obviously gives some insight into my politics, but it shows how the whole 'process' is devised to support corporate economics. I also feel it has a 90s science fiction feel with the B&W artwork and overall approach. I'm not 100% sold yet, but I think it has quite a bit of promise.